I didn’t fill the freezer totally like I had planned. Mix all ingredients together in a bowl. 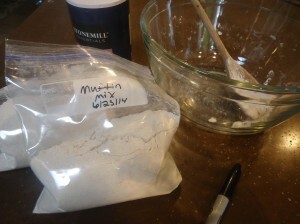 Divide 2 3/4 cup of the mix into an air tight containers or bags for up to 6 months in the freezer. Pour dry muffin mix into bowl. Add 1 egg, 1/2 cup milk and 1/4 cup butter. Fold in blueberries, chocolate chips, or bananas for different flavored muffins. Bake at 375* for 20 minutes or until knife comes out clean.